Achieving the authentic roasted beef aroma takes a lot of time, uses many ingredients and is costly. Knorr Demi Glace delivers authentic roasted beef aroma in less time and cost. All food additive used are from plant and animal origin. May contain traces of cereals containing gluten, egg, fish, crustacean, mollusc, soy, milk, peanut and tree nuts. 1. 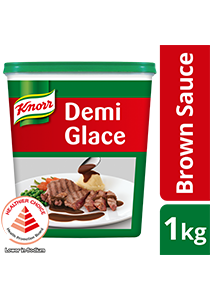 Dissolve 100g of Knorr Demi Glace Brown Sauce Mix in 1L of room temperature water. 2. Bring mixture to a boil, stirring frequently, and simmer for 3 minutes before removing from heat. 3. Use sauce as it is, or as a base for other sauces such as peppercorn or mushroom sauce. After opening, close lid tightly, store in cool and dry place.